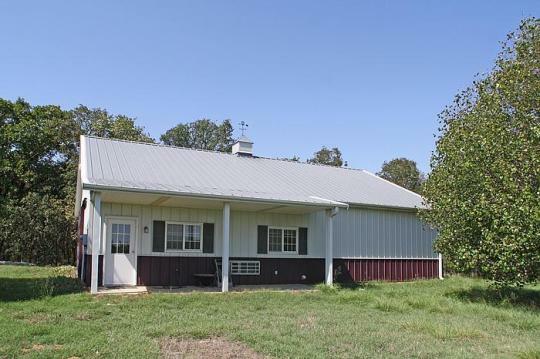 This ranch will appeal to the discriminating buyer who desires a secluded home and location that offers agriculture and recreation. 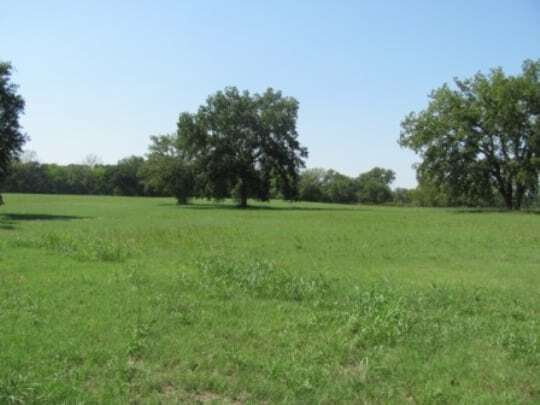 The property is located in the Deep Fork River bottom near the Three Bridges area just south of Bristow,Oklahoma. The elevation changes, which range from 750 feet near the entrance to 720 feet in the bottom near the Deep Fork, add to the character of the property. 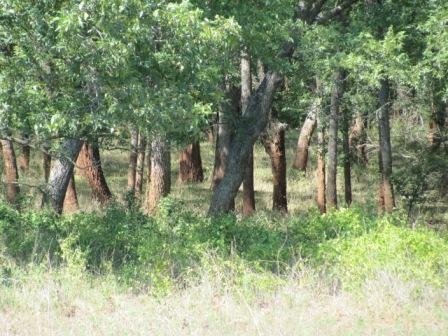 The ranch was built with deep respect for the land, wildlife and agriculture value of the property. The secluded home, built in 1998, mirrors the owner’s desire for an easily maintained home built for relaxed country living. The discriminating buyer will appreciate the techniques and materials utilized for construction; some apparent and others reflected in the building plans. The Morton Barn is located a few hundred yards from the home and an open front Morton equipment building is nearby. The soils will vary from the highly productive bottom land soils near the Deep Fork to upland soils that are predominately covered with oak/blackjack woody species. The lower pasture areas near the Deep Fork flood plain will contain a myriad of woody species common to the river bottom soils. The major pasture base is Bermuda grass complimented with other introduced grasses and legumes. The Deep Fork River drainage is well known for its varied wildlife population of game and non-game species. 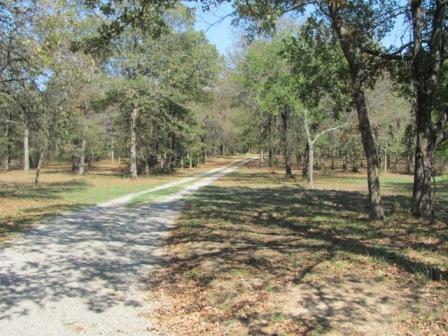 The varied ecosystem found on this ranch supports and offers a multitude of recreation opportunities. Every exploration into the river area will present a new tree or plant, a reclusive wildlife species or change to the river flow. LOCATION: South of Bristow, Gypsy and the Three Bridge’s area of 385th W. Avenue and W. 331st Street South. The drive time is approximately 20 minutes to Bristow and 60 minutes to Tulsa. Although high water is not an issue with accessibility, a new bridge is planned to replace the “Three Bridges” over the Deep Fork River. 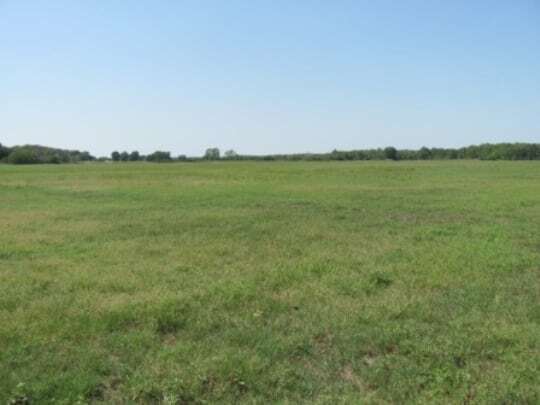 ACREAGE: 240+/- acres with possible limited mineral ownership. There are no producing wells on the property. All owned mineral interest will transfer with the sale. 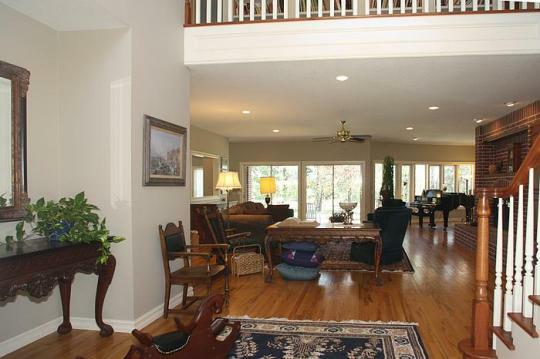 HOME: The 4350 s/f home, built in 1998, is well located in a secluded and park like setting. It is approximately one quarter mile from the County Road and overlooks the bottom land pastures and the Deep Fork River bottom. A video tour may be accessed at http://homesite.obeo.com/viewer/default.aspx?tourid=747137&locale=en-US PDF brochure of the home with photos is available by contacting the brokers. 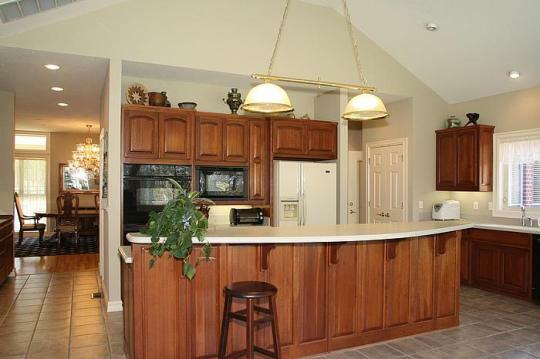 ● 4 Bedroom – 3 and ½ bath. ● 3 car garage 1,080 sq feet. ● The home utilizes all electric appliances with the exception of a wood burning insert in the fireplace. 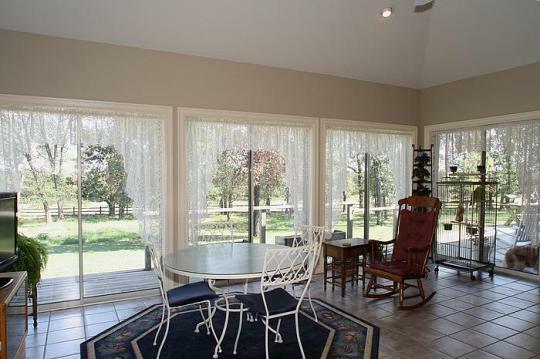 ● Fully insulated – floor, walls, and ceiling with quality double pane windows. ● 2 X 6 construction – Foundation with crawl space. ● New roof with updated ventilation system. ● Water for the home is provided by a well that could easily furnish fresh water to all the pastures. Another well is near the corrals in the southwest portion of the ranch. ● HVAC new, central and zoned in ground geothermal system. ● Septic system is well engineered with a large disposal field and serves the home and barn. 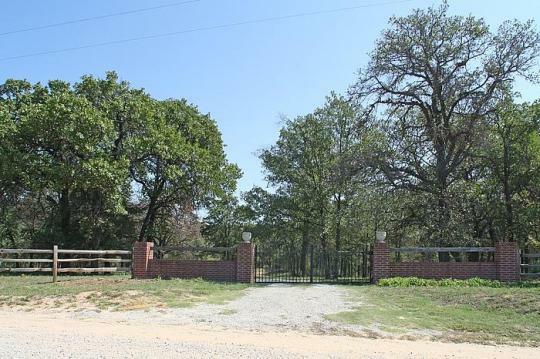 ● Gated entrance with a pleasing entrance road. A state of the art 1,725 s/f Morton Barn is adjacent, a few hundred yards to the north, of the residence. The concrete floored building is heated and equipped with a Preifert Stall System, wash rack and tack room. The building served as a residence during the construction of the home and includes a bath, kitchen and sleeping area. 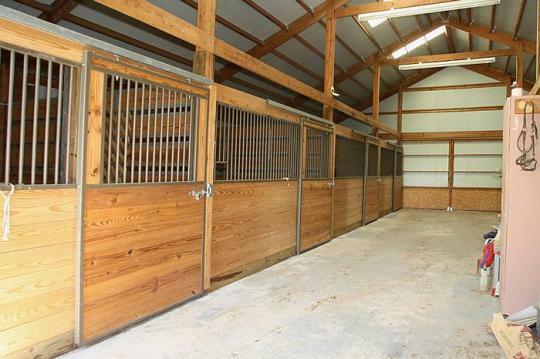 A 1,150 open front Morton Equipment shed is also located within a well fenced area that includes the barn. 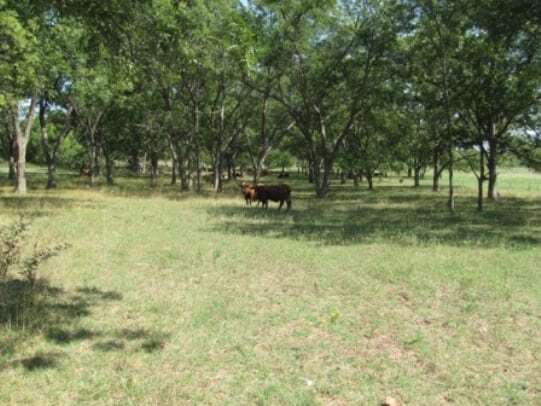 PASTURES: The introduced forage base, in the lower areas of the ranch, is predominately composed of the Teller and Renach soils and of the Konawa soils in the higher locations. The highly productive Keokuk loam is found in some of the lower areas that are occasionally flooded. Bermuda grass seems to be the primary forage base that is complimented by fescue, Johnson grass, Florida paspalum, and some native Tallgrass Prairie grasses. The pastures soils could easily support annual ryegrass, clovers and perhaps other introduced forages if the manager is interested in maximizing grazing production. The upland are composed of predominantly oak, blackjack, and hickory found on Cross Timbers sites with some native Tallgrass Prairie grasses, forbs and legumes found in the understory. Pecan, Walnut, elm, sycamore, persimmon, ash, redbud and several species of oak are just a few of the bottom land trees and shrubs found in the Deep Fork bottom. WILDLIFE: As previously noted, the Deep Fork is known for its varied game, non-game wildlife and recreation value. Deer and turkey are prominent in the Deep Fork watershed, in fact nearby Okfuskee County has two entries in the top 10 for the Cy Curtis non-typical deer for 2011. Besides turkey, dove and waterfowl are game birds found readily in the river watershed. Squirrel, rabbit, fox and bobcat are just a few of the varied mammal species while upland and bottom land bird species, and even an occasional eagle, add to the variety of wildlife. TAXES: The 2011 advalorem taxes were $3765 for the land, residence and buildings. The ranch will qualify for Accelerated Federal Income Tax Depreciation if it is extended by congress. The depreciation incentive provides a shorter recovery period for most non-residential depreciable ranch property. DIVISION: A suggested division would sell 60 acres+/- with road access, an attractive entrance, the Morton barn and shed, wooded terrain, some open pasture and two ponds. 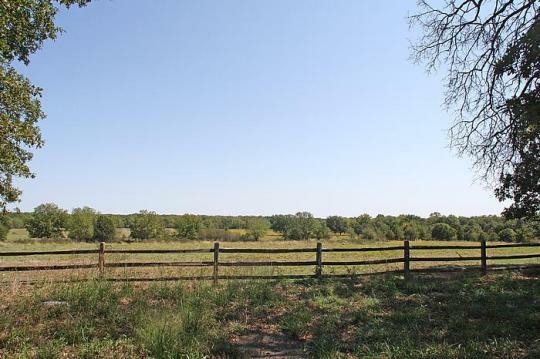 The remaining acreage would be offered as one tract.